nodio 1st generation, originally uploaded by hc gilje. 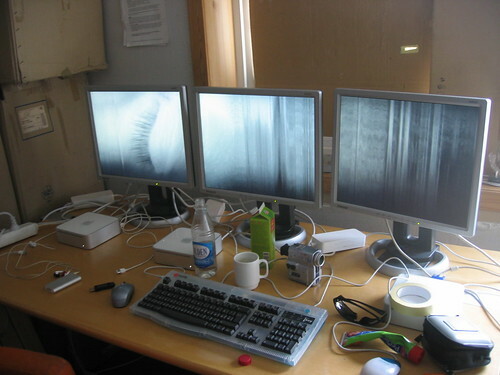 The series of experiments which I have called nodio (nodes of video and audio) started in the spring of 2005 when I got a short residency at BEK and an opportunity to show it at prøverommet BETA. nodio is a networked multichannel audiovisual system, where each node in the system is a source both for video and audio. The nodes are linked either by a LAN or WLAN network. So far the nodio project has resulted in the installations dense and drift, and the system was also used on the last kreutzerkompani performance irre. My interest is to explore what happens when combining several audiovisual sources, where maybe the most interesting things happens in between the screens: the development of patterns and rhythms, and of audiovisual “powerchords”, but also to look at the spatial aspect of having several sources in a physical space that you can move around in, and where the image and sound changes the space. and fades can be triggered individually or globally. Sound is created by image analysis of the current video being played. this creates a very tight relation between the image and sound, and when images are moved around to the different nodes in a space, the sound moves with them. The software is made using maxmsp and jitter, and the hardware is a macmini for each node. The following video shows some of the possibillities in the first generation of nodio during a residency at BEK in Bergen (spring 2005) and Tesla in Berlin (autumn 2005).